The goal of this portion of the project is to investigate the efficacy of computer-generated prompts to guide a child with autism through the self-care task of handwashing. Findings from this research could, in the long term, help to augment a caregiver’s ability to provide systematic prompts and assistance by developing an intelligent computerized system that could provide automated prompts to children with ASD during the completion of self-care activities. identify aspects that could result in more effective computer-based guidance. 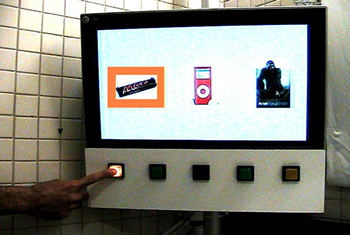 The current system consists of a small overhead video camera, a flat screen monitor, speakers, and a computer with a touch screen monitor, and a set of interactive push-buttons (Figure 1 ). 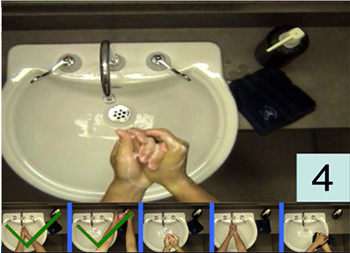 The system uses the video camera to track the child’s progress through the handwashing task and, if needed, audio-visual prompts for the next step in the task are played on the monitor and speakers (Figure 2 ). A picture schedule also appears on the monitor to allow the child to note their progress through the activity (Figure 2 ). Prompts can vary in specificity, from minimal to detailed instructional information. To promote as much independence as possible, the system begins by presenting the lowest level of detail before advancing through the higher levels. A user interface allows caregivers to use the touch screen monitor to customize the system to adapt to their child’s individual needs and preferences. Previous research conducted by our lab shows that the most successful prompting strategies included the use of verbal and non-verbal prompts together, picture schedules and positive reinforcement in the form of verbal/tactile reinforcement and rewards. Therefore, these elements have all been integrated into the design of the prompting system. Tactile reinforcement is made possible by the use of the push-buttons, which the child can use to (1) choose a reward to be received upon completion of the activity, and (2) input to the system when each step of the activity has been completed (Figure 3). The device has recently been evaluated in a set of trials involving 5 children (aged 4.5 - 6.5 years) with ASD. The results of the study are promising, as parents and children alike generally seemed to respond well to the device: children performed hand washing better while using the device and most parents expressed a definite interest in owning such a device. Future work includes porting the system to a portable tablet, and running trials in the community. Figure 1: System Setup. An overhead camera captures images that are analyzed by a computer. 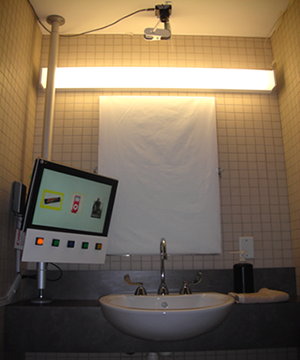 Audio-visual prompts are played over a speaker and a monitor beside the sink. An interactive module consisting of a panel of illuminated push-buttons that is intended to make the task more fun for the child. Figure 2: The Prompting Display. Visual prompts can be pictures or instructional videos. A countdown timer can be used to show how much time is remaining to complete a step in the task (e.g., scrubbing hands). A picture schedule lets the child observe his or her progress through the activity. Figure 3: Interactive module. To motivate the child, at the start of the task the child is instructed to use the buttons to choose a reward for the completion of the task. The buttons can also be used in other ways during the activity and are meant to make the activity fun for the child.